Bombardier: Tariff Row or Marketing Opportunity? September 27, 2017 18:31 / 5 Comments on Bombardier: Tariff Row or Marketing Opportunity? 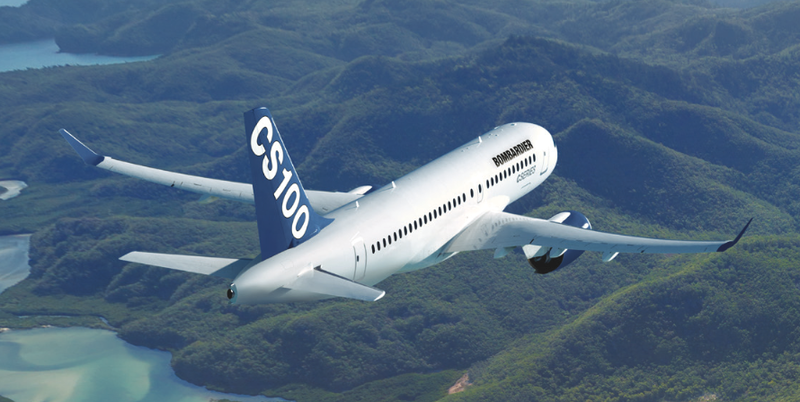 Bombardier CS100 passenger aircraft. Image courtesy of BombardierAerospace. Just in case you’re counting along at home; If the company receives 1/3 of all single passenger jet sales in China over the next 20-years, it would need to deliver 6-jets per day to China. Full transcript and video of UK Prime Minister Theresa May laying out her grand vision for a European partnership in the post-Brexit timeframe focusing on the key points of, ‘Shared History, Shared Challenges, Shared Future’ in her speech delivered in Florence, Italy on September 22, 2017. “It’s good to be here in this great city of Florence today at a critical time in the evolution of the relationship between the United Kingdom and the European Union. It was here, more than anywhere else, that the Renaissance began – a period of history that inspired centuries of creativity and critical thought across our continent and which in many ways defined what it meant to be European. A period of history whose example shaped the modern world. A period of history that teaches us that when we come together in a spirit of ambition and innovation, we have it within ourselves to do great things. For many, this is an exciting time, full of promise; for others it is a worrying one. I look ahead with optimism, believing that if we use this moment to change not just our relationship with Europe, but also the way we do things at home, this will be a defining moment in the history of our nation. And it is an exciting time for many in Europe too. The European Union is beginning a new chapter in the story of its development. Just last week, President Juncker set out his ambitions for the future of the European Union. There is a vibrant debate going on about the shape of the EU’s institutions and the direction of the Union in the years ahead. We don’t want to stand in the way of that. The only way for us to respond to this vast array of challenges is for likeminded nations and peoples to come together and defend the international order that we have worked so hard to create – and the values of liberty, democracy, human rights and the rule of law by which we stand. Our commitment to the defence – and indeed the advance – of our shared values is undimmed. Their decision to leave the institution of the European Union was an expression of that desire – a statement about how they want their democracy to work. They want more direct control of decisions that affect their daily lives; and that means those decisions being made in Britain by people directly accountable to them. The strength of feeling that the British people have about this need for control and the direct accountability of their politicians is one reason why, throughout its membership, the United Kingdom has never totally felt at home being in the European Union. And perhaps because of our history and geography, the European Union never felt to us like an integral part of our national story in the way it does to so many elsewhere in Europe. It is a matter of choices. The profound pooling of sovereignty that is a crucial feature of the European Union permits unprecedentedly deep cooperation, which brings benefits. For while the UK’s departure from the EU is inevitably a difficult process, it is in all of our interests for our negotiations to succeed. If we were to fail, or be divided, the only beneficiaries would be those who reject our values and oppose our interests. We have now conducted three rounds of negotiations. And while, at times, these negotiations have been tough, it is clear that, thanks to the professionalism and diligence of David Davis and Michel Barnier, we have made concrete progress on many important issues. The UK government, the Irish government and the EU as a whole have been clear that through the process of our withdrawal we will protect progress made in Northern Ireland over recent years – and the lives and livelihoods that depend on this progress. We owe it to the people of Northern Ireland – and indeed to everyone on the island of Ireland – to see through these commitments. Of course, we recognise that we can’t leave the EU and have everything stay the same. Life for us will be different. But what we do want – and what we hope that you, our European friends, want too – is to stay as partners who carry on working together for our mutual benefit. That is why in my speech at Lancaster House I said that the United Kingdom would seek to secure a new, deep and special partnership with the European Union. And this should span both a new economic relationship and a new relationship on security. So our task is to find a new framework that allows for a close economic partnership but holds those rights and obligations in a new and different balance. In fact, we start from an unprecedented position. For we have the same rules and regulations as the EU – and our EU Withdrawal Bill will ensure they are carried over into our domestic law at the moment we leave the EU. European Economic Area membership would mean the UK having to adopt at home – automatically and in their entirety – new EU rules. Rules over which, in future, we will have little influence and no vote. As for a Canadian style free trade agreement, we should recognise that this is the most advanced free trade agreement the EU has yet concluded and a breakthrough in trade between Canada and the EU. But compared with what exists between Britain and the EU today, it would nevertheless represent such a restriction on our mutual market access that it would benefit neither of our economies. Not only that, it would start from the false premise that there is no pre-existing regulatory relationship between us. And precedent suggests that it could take years to negotiate. The European Union has shown in the past that creative arrangements can be agreed in other areas. For example, it has developed a diverse array of arrangements with neighbouring countries outside the EU, both in economic relations and in justice and home affairs. Furthermore, we share the same set of fundamental beliefs; a belief in free trade, rigorous and fair competition, strong consumer rights, and that trying to beat other countries’ industries by unfairly subsidising one’s own is a serious mistake. So there is no need to impose tariffs where we have none now, and I don’t think anyone sensible is contemplating this. And as we have set out in a future partnership paper, when it comes to trade in goods, we will do everything we can to avoid friction at the border. But of course the regulatory issues are crucial. People in Britain do not want shoddy goods, shoddy services, a poor environment or exploitative working practices and I can never imagine them thinking those things to be acceptable. The government I lead is committed not only to protecting high standards, but strengthening them. So we will need to discuss with our European partners new ways of managing our interdependence and our differences, in the context of our shared values. There will be areas of policy and regulation which are outside the scope of our trade and economic relations where this should be straightforward. There will be areas which do affect our economic relations where we and our European friends may have different goals; or where we share the same goals but want to achieve them through different means. And there will be areas where we want to achieve the same goals in the same ways, because it makes sense for our economies. This could not mean the European Court of Justice – or indeed UK courts – being the arbiter of disputes about the implementation of the agreement between the UK and the EU however. It wouldn’t be right for one party’s court to have jurisdiction over the other. But I am confident we can find an appropriate mechanism for resolving disputes. So this new economic partnership, would be comprehensive and ambitious. It would be underpinned by high standards, and a practical approach to regulation that enables us to continue to work together in bringing shared prosperity to our peoples for generations to come. Of course, there is no pre-existing model for co-operation between the EU and external partners which replicates the full-scale and depth of the collaboration that currently exists between the EU and the UK on security, law enforcement and criminal justice. But as the threats we face evolve faster than ever, I believe it is vital that we work together to design new, dynamic arrangements that go beyond the existing arrangements that the EU has in this area – and draw on the legal models the EU has previously used to structure co-operation with external partners in other fields such as trade. So we are proposing a bold new strategic agreement that provides a comprehensive framework for future security, law enforcement and criminal justice co-operation: a treaty between the UK and the EU. This would complement the extensive and mature bi-lateral relationships that we already have with European friends to promote our common security. Our ambition would be to build a model that is underpinned by our shared principles, including high standards of data protection and human rights. It would be kept sufficiently versatile and dynamic to respond to the ever-evolving threats that we face. And it would create an ongoing dialogue in which law enforcement and criminal justice priorities can be shared and – where appropriate – tackled jointly. So what we are offering will be unprecedented in its breadth, taking in cooperation on diplomacy, defence and security, and development. And it will be unprecedented in its depth, in terms of the degree of engagement that we would aim to deliver. Taken as a whole, this bold new security partnership will not only reflect our history and the practical benefits of co-operation in tackling shared threats, but also demonstrate the UK’s genuine commitment to promoting our shared values across the world and to maintaining a secure and prosperous Europe. We will no longer sit at the European Council table or in the Council of Ministers, and we will no longer have Members of the European Parliament. Our relations with countries outside the EU can be developed in new ways, including through our own trade negotiations, because we will no longer be an EU country, and we will no longer directly benefit from the EU’s future trade negotiations. But the fact is that, at that point, neither the UK – nor the EU and its Members States – will be in a position to implement smoothly many of the detailed arrangements that will underpin this new relationship we seek. Neither is the European Union legally able to conclude an agreement with the UK as an external partner while it is itself still part of the European Union. And such an agreement on the future partnership will require the appropriate legal ratification, which would take time. Clearly people, businesses and public services should only have to plan for one set of changes in the relationship between the UK and the EU. So during the implementation period access to one anothers’ markets should continue on current terms and Britain also should continue to take part in existing security measures. And I know businesses, in particular, would welcome the certainty this would provide. For example, it will take time to put in place the new immigration system required to re-take control of the UK’s borders. So during the implementation period, people will continue to be able to come and live and work in the UK; but there will be a registration system – an essential preparation for the new regime. It is clear that what would be most helpful to people and businesses on both sides, who want this process to be smooth and orderly, is for us to agree the detailed arrangements for this implementation period as early as possible. Although we recognise that the EU institutions will need to adopt a formal position. And at the heart of these arrangements, there should be a clear double lock: a guarantee that there will be a period of implementation giving businesses and people alike the certainty that they will be able to prepare for the change; and a guarantee that this implementation period will be time-limited, giving everyone the certainty that this will not go on for ever. But in this context I am conscious that our departure causes another type of uncertainty for the remaining member states and their taxpayers over the EU budget. Still I do not want our partners to fear that they will need to pay more or receive less over the remainder of the current budget plan as a result of our decision to leave. The UK will honour commitments we have made during the period of our membership. And as we move forwards, we will also want to continue working together in ways that promote the long-term economic development of our continent. This includes continuing to take part in those specific policies and programmes which are greatly to the UK and the EU’s joint advantage, such as those that promote science, education and culture – and those that promote our mutual security. And as I set out in my speech at Lancaster House, in doing so, we would want to make an ongoing contribution to cover our fair share of the costs involved. When I gave my speech at the beginning of this year I spoke not just about the preparations we were making for a successful negotiation but also about our preparations for our life outside the European Union – with or without what I hope will be a successful deal. And the necessary work continues on all these fronts so that we are able to meet any eventual outcome. But as we meet here today, in this city of creativity and rebirth, let us open our minds to the possible. To a new era of cooperation and partnership between the United Kingdom and the European Union. And to a stronger, fairer, more prosperous future for us all. A sovereign United Kingdom and a confident European Union, both free to chart their own course. A new alliance that can stand strongly together in the world. There are other reasons why our future should give us confidence. We will always be a champion of economic openness; we will always be a country whose pitch to the world is high standards at home. When we differ from the EU in our regulatory choices, it won’t be to try to attain an unfair competitive advantage, it will be because we want rules that are right for Britain’s particular situation. I recognise that this is not something that you – our European partners – wanted to do. It is a distraction from what you want to get on with. But we have to get this right. Transcript and video of UK Prime Minister Theresa May’s speech to the United Nations General Assembly, New York City, United States on September 20, 2017 on the vast array of challenges to the existing international order and the shared values of fairness, justice and human rights that unite United Nations member countries. “Mr President, Excellencies, ladies and gentlemen, I would like to begin by expressing my sincere condolences to the government and people of Mexico following the devastating earthquake. I also want to reiterate my sympathies to those affected by the recent hurricanes in the Caribbean. Our thoughts are with them all at this time. As we meet at this General Assembly we face challenges that go right to the heart of who we are as nations. Challenges that test our values, our vision and our resolve to defend the rules and standards that underpin the security and prosperity of our fellow citizens. As I argued in my speech here last year, many of these challenges do not recognise or respect geographical boundaries. I think of course of the terrorism that has struck so many of our countries including my own 5 times this year. And fuelling that terrorist threat the increasing numbers being drawn to extremist ideologies not only in places riven by conflict and instability, but many online in their homes thousands of miles away from those conflicts. I think of the climate change which is depleting and degrading the planet we leave to our children. And I think of the vast challenges that come from the mass displacement of people. Many are refugees fleeing conflict and persecution. Others, are economic migrants, prepared to risk everything on perilous sea crossings in the desperate search for a better life for themselves and their children. Through this migration we also see the challenges of economic inequality between countries and within them. This inequality, together with weaknesses in the global trading system, threatens to undermine support for the forces of liberalism and free trade that have done so much to propel global growth. And it is pushing some countries towards protectionism in the belief that this best defends the interests of their own people. And as the global system struggles to adapt we are confronted by states deliberately flouting for their own gain the rules and standards that have secured our collective prosperity and security. The unforgiveable use of chemical weapons by the Syrian regime against its own people and perhaps foremost in our minds today the outrageous proliferation of nuclear weapons by North Korea and a threat to use them. I believe that the only way for us to respond to this vast array of challenges is to come together and defend the international order that we have worked so hard to create and the values by which we stand. For it is the fundamental values that we share, values of fairness, justice and human rights, that have created the common cause between nations to act together in our shared interest and form the multilateral system. And it is this rules-based system which we have developed, including the institutions, the international frameworks of free and fair trade, agreements such as the Paris Climate Accord and laws and conventions like the Non-Proliferation Treaty, which enables the global cooperation through which we can protect those values. Indeed, the defining purpose of the UN Charter is to maintain international peace and security, to develop friendly relations among nations, to achieve international cooperation in solving problems of an economic, social, cultural or humanitarian character; and to be a centre for harmonising the actions of nations in the attainment of those common ends. And I do not see these as vaunted ideals to be held for their own sake. These values and the rules they imbue are central to our national interest, to our security and prosperity. And the international system with the UN at its heart is the amplifying force that enables countries to cooperate and live up to the standards in word, spirit and deed, to our collective and individual benefit. If this system we have created is found no longer to be capable of meeting the challenges of our time then there will be a crisis of faith in multilateralism and global cooperation that will damage the interests of all our peoples. So those of us who hold true to our shared values, who hold true to that desire to defend the rules and high standards that have shaped and protected the world we live in, need to strive harder than ever to show that institutions like this United Nations can work for the countries that form them and for the people who we represent. This means reforming our United Nations and the wider international system so it can prove its worth in helping us to meet the challenges of the 21st Century. And it means ensuring that those who flout the rules and spirit of our international system are held to account, that nations honour their responsibilities and play their part in upholding and renewing a rules-based international order that can deliver prosperity and security for us all. First, we must ensure that our multilateral institutions can deliver the aspirations on which they were founded. Think of UNHCR looking after those who’ve been driven out of their homes. The OPCW striving for a world free of chemical weapons. UNICEF helping children in danger. These are all vital missions where the UN surely has a unique role to play. And that is why the UK has over 70 years been such a pioneering supporter of these organisations and more. But we should also acknowledge that throughout its history the UN has suffered from a seemingly unbridgeable gap between the nobility of its purposes and the effectiveness of its delivery. When the need for multilateral action has never been greater the shortcomings of the UN and its institutions risk undermining the confidence of states as members and donors. Even more importantly they risk the confidence and faith of those who rely upon the blue helmets, who rely upon that sign I stand in front of today coming to their aid in the darkest of hours. So we must begin by supporting the ambitious reform agenda that Secretary-General Guterres is now leading to create a more agile, transparent and joined-up organisation. Much of this work will be practical and unglamorous. It will require the UN to deliver better cooperation on the ground between agencies, remove competition for funding and improve gender equality. But it will also require real leadership to confront damaging issues that have beset the UN. So I welcome the Secretary-General’s new circle of leadership on preventing sexual exploitation and abuse in UN operations and I’m pleased to be part of this initiative. We, the nations of the UN, need to give the Secretary-General our backing for these reforms and as an outward-looking global Britain and the second biggest funder of the UN the UK will remain committed to spending 0.7% of GNI on development and humanitarian support. We will use our military to support peacekeeping and our diplomats will continue to work to tackle conflict and support peace building. In turn the UN and its agencies must win our trust by proving to us and to the people we represent that they can deliver. And that is why we will remain generous in our funding but set aside 30% to be paid only to those parts of the UN that achieve sufficient results. But this is about more than technical reforms, important as they are. It is also about reforms that enable the United Nations to truly respond to the global challenges of the 21st century. At last year’s General Assembly we undertook to do far more to resolve the challenges of refugee and migration flows. We agreed to develop global compacts to address the causes and the consequences of the mass movements of people we see today. This was an important step to elevate significantly our global response and enable us collectively to tackle this challenge of our times. So in the year ahead as well as agreeing the principles of these compacts we must ensure they can be applied in practice. We must do more to identify, protect and support refugees and those hosting them near conflicts. And on migration our starting point must be that it can benefit both countries and migrants themselves but only when it is safe, orderly, well-managed and legal. If we do not manage this effectively, we will fail both our own citizens and those taking these dangerous journeys. And we will push more people into the curse of modern slavery and the hands of the human traffickers and organised criminal groups that drive this inhuman industry. But the steps we are agreeing through these compacts alone will not be enough. For if people cannot find jobs, opportunity and hope for themselves and their families where they live they will continue to look elsewhere. And so as the United Nations and as members, we must work harder to combine the efforts of our development programmes with the private sector and the international financial institutions. To support the creation of jobs and livelihoods that will address not just the consequences, but the causes of this great challenge of our time. For the truth is that despite our best efforts, we are not succeeding. We must do more. The same is true with terrorism, where again the challenges we face today are vastly different from those of previous eras. When terrorists struck London and Manchester this year, the world saw our cities come together in defiance. Our parliament carries on. Ariana Grande came back to Manchester and sang again. London Bridge is bustling with people. Our communities came together at the Finsbury Park mosque in North London. And Londoners got back on the Tube. The terrorists did not win, for we will never let anyone destroy our way of life. But defiance alone is not enough. As leaders, we have all visited too many hospitals, and seen too many innocent people murdered in our countries. In the last decade, hundreds of thousands have been killed by terrorists across the world. This is a truly global tragedy that is increasingly touching the lives of us all. This year is the tenth anniversary of the death of the woman who introduced me to my husband, and who was known well to many of us in this United Nations. Benazir Bhutto was brutally murdered by people who actively rejected the values that all of us here in this United Nations stand for. In a country that has suffered more than most at the hands of terrorists. Murdered for standing up for democracy, murdered for espousing tolerance, and murdered for being a woman. When I think of the hundreds of thousands of victims of terrorism in countries across the world, I think of their friends, their families, their communities, devastated by this evil, and I say enough is enough. So of course, we must continue to take the fight to these terrorist groups on the battlefield. And the UK will remain at the forefront of this effort, while also helping to build the capabilities of our alliances and our partners to better take on this challenge. And we must also step up our efforts as never before to tackle the terrorist use of the internet. For as the threat from terrorists evolves, so must our cooperation. And that is why today, for the first time in the UN, governments and industry through the Global Internet Forum for Counterterrorism will be coming together to do just that. The tech companies have made significant progress on this issue, but we need to go further and faster to reduce the time it takes to reduce terrorist content online, and to increase significantly their efforts to stop it being uploaded in the first place. This is a major step in reclaiming the internet from those who would use it to do us harm. But ultimately, it is not just the terrorists themselves who we need to defeat, it is the extremist ideologies that fuel them. It is the ideologies that preach hatred, sow division and undermine our common humanity. We must be far more robust in identifying these ideologies and defeating them across all parts of our societies. As I said in the aftermath of the attack on London Bridge this summer, we have to face the fact that this will require some difficult conversations. We all need to come together, to take on this extremism that lives among us, and to nurture the common values that must ultimately win out. These are the values of this United Nations. And yet, despite our best efforts, we as nations and as a United Nations have not found the ways or the means to truly take on this threat. And that is why today, as I talk about UN reform, I ask the Secretary General to make this fight against terrorists and the ideologies that drive them a core part of his agenda, at the heart of our development, peace building, and conflict prevention work. And to give this effort the prominence it surely requires. I’m calling on the Secretary General to make this a theme of next year’s General Assembly and use this to harness the efforts of governments, the private sector, and civil society so that we can truly strike the generational blow against this vile evil in our world. And as we do so, we must clearly strike the balance between protecting our people and protecting their freedoms. And we must always guard against those who would use the fight against terrorism as a cover for oppression and the violation of human rights. So as we look at the situation in Northern Burma, I call on the Burmese authorities to put an end to the violence, allow humanitarian access, and fully implement Annan Commission recommendations. And so by reforming our multinational institutions, we can strengthen their ability to deliver for the people we serve, protect the vulnerable and fight injustice. We can enable multilateralism to multiply the effect of our individual commitments through its convening power and spending power. Through the economies of scale it can bring, the standards it can set, the moral leadership it can harness, and the legitimacy it can confer. But multilateralism can only reflect the values that individual states project, and can only multiply the commitments that they are prepared to make. It is strong nations that form strong institutions, and which provide the basis of the international partnerships and cooperation that brings stability to our world. And so it falls to us all to decide whether we will honour the responsibilities that we have to one another. I’ve talked about the role of the UN in stepping up on counterterrorism. But this is an area where we as states have critical responsibilities, which the UN cannot itself address alone, for it is inescapable that the terrorism conflict and the instability that we see across the world is in many cases driven by the actions of states acting through proxies. So when countries back groups like Hezbollah to increase instability and conflict across the Middle East, support so-called separatists in Ukraine to create instability on Europe’s eastern borders, or give tacit support to criminal groups launching cyber-attacks against our countries and institutions, they call into question the very rules and international systems that protect us. And that is why, both globally, but also in our own continent of Europe, the UK will remain steadfast in our commitment and responsibility to ensure the security and stability of our friends and allies as we have done for generations. And just as it the responsibility of nations not to seek to advance their interests through terrorist or proxy groups, so it is also the responsibility of each of is to act together in the face of the most egregious violations of our common rules and standards. Clearly responsibility for the chaos and tragedy that we see in Syria lies firmly at the door of Asaad. He and his backers have continually frustrated the efforts of the UN to act as the broker of peace through the Geneva Process. As responsible states, we must not abandon our support for the UN’s attempts to secure peace and stability in Syria. And indeed, we must continue to call on all those with influence on the regime to bring them to the table. But in recent weeks, the UN has also confirmed what we all knew, namely that the Syrian regime has used chemical weapons on its own people. In the face of that, we have a responsibility to stand up, to hold the Syrian regime to account. This responsibility sits with us all, but a particular special responsibility lies on the shoulders of the permanent members of the security council. And as one of these five members, the United Kingdom takes our special responsibility seriously. So I am proud that we have used the full weight of our diplomacy to ensure that we have not had to exercise our veto in a generation. Seeking to foster international cooperation, not frustrate it. But others have not done so. One country in particular has used its veto as many times in the last five years as in the whole of the second half of the Cold War. And in so doing, they have prevented action against a despicable regime that has murdered its own people with chemical weapons. As a result, in Syria, the United Nations has been blocked. This has undermined the values that we hold dear, and the international rules based system that is the basis of security and prosperity around the world. Now we face an even more immediate, global danger in the activities of Kim Jong Un and his regime in DPRK. Time after time he’s shown contempt for the international community of law-abiding states. Contempt for his neighbours and contempt for the institutions and rules that have preserved peace and security. On this challenge, the UN in recent weeks has shown it can step up to the task. With last Monday’s security council resolution creating the biggest sanctions package of the 21st Century. We have seen regional and global powers coming together and as in its founding charter putting aside limited self-interests to show leadership on behalf of the wider world. But despite these efforts, DPRK continues to defy and provoke the international community and threaten its neighbours. And unless all security council members continue to live up to the special responsibilities that are placed upon us, and in seeking to resolve this crisis, be prepared to take on necessary measures to tackle this threat, we will not be able to bring stability to the Korean Peninsula. So as the world looks on, I am calling for further steps and for nations with this special responsibility to work together and exert the pressure we know is necessary to force Kim Jong Un to change his ways. Let us not fail this time. Let our message to North Korea be clear. Our determination to uphold these rules is stronger by far than their determination to undermine them. Mr. President, throughout the history of this United Nations, countries have shown time and time again that by being true to our values, rules, and standards, it is possible to come together and to deliver in ways that have the most extraordinary impact on the lives of the people we serve. I believe we can do so again. We must do so again, and we will do so again.